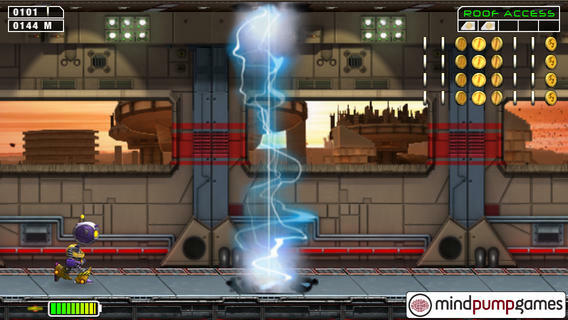 SpringJack is an iPhone game developed by Mind Pump Games Ltd. 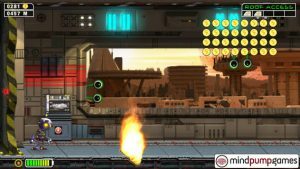 If you’re in the market for a new platformer, this newcomer to the App Store is a really enjoyable game. 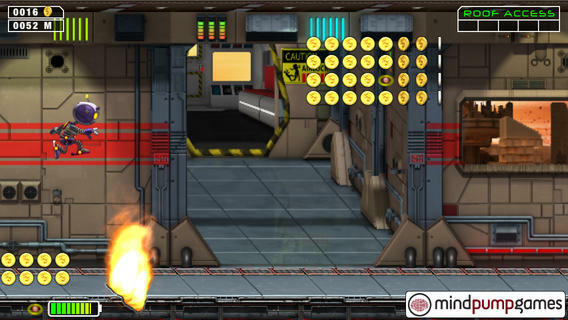 In SpringJack, you play as a robot who is leaping through the bowels of a crashed spaceship. Unfortunately, that spaceship has a big problem: a quantum reactor core that needs to be shut down. Between the dangerous fires and the disgusting toxic goop in the ship, there are tons of interesting objects that you will need to avoid. There are also tons of missions to complete, which keeps this game feeling fresh and fun for weeks after you’ve first downloaded it. The controls are very simple, and the tutorial is delightfully brief…that means you can get the actual game underway within seconds of starting up SpringJack for the first time. The controls are well-calibrated and wonderfully responsible. As of Version 1.1 (the most current version of this game), all upgrades for SpringJack have been unlocked. That means that each and every player now has access to all the fun gadgets and toys this game has to offer. 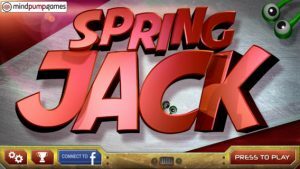 If you love platformers, games with a sci-fi bent, or just need a new mindless time waster, SpringJack is a worthy choice. Grab this free game, and find out just how addictive this fast-paced little gem can be. For all the latest news on this exciting new iOS tile, connect with SpringJack on Facebook (Facebook.com/springjackgame). You can also watch this playthrough video on YouTube if you want to see the game in action before you download it! SpringJackrequires iOS 6.0 or later. Compatible with iPhone, iPad, and iPod touch. This app is optimized for iPhone 5.